In this module you will be introduced to Excel, how to navigate the menu and the different tasks that can be done with it. There are many new and improved features in this version of Excel. This module will show you these changes that will allow you to be more productive. 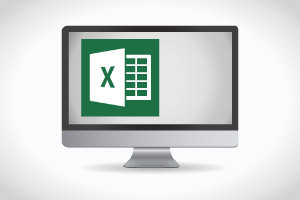 This module will help you get set up and started using Excel. These simple step by step instructions will guide you through creating and saving a workbook and show you how to complete basic tasks. This module will get you started working on a spreadsheet, doing basic math, add and delete columns and rows and prepare the worksheet for printing. This module explains that when working with formulas the results automatically update when values are changed and also how to use functions which are more complicated formulas. You will be introduced to VLOOKUP in this module; it is used to look up a value to find corresponding data on the same row. This module explains how to use conditional formatting to make your data stand out, this helps you to analyse data and to determine patterns and trends. Here you will be shown Sparklines which are tiny charts that fit into a spreadsheet cell, these give a visual representation of your data to help spot patterns and trends. In this module you will learn to apply tables in Excel, their used to store related information to make it easier to format, sort and total your data. In this module you will learn about the IF function, this checks if a condition you specify is true or false and it executes a reaction depending on the result. There are many different charts in Excel for representing different data visually to show comparisons, patterns and trends. You will be shown how to save and execute a macro in this module, macros are used to record a set of instructions you do all the time to use whenever you want. This module explains how dates are stored in Excel for using in formulas to get the number of days between two dates. You will be shown in this module how to use more complex formulas for figuring out mortgage repayments and calculating the accumulative interest on your savings. In this module you will learn how to use CTRL key shortcuts and ALT key shortcuts to gain a quicker workflow. This module guides you through the various Security options available within Office 2010, including Protected View, Trusted Documents and Enabling Active Content.